Albert van der Sel : Surface- and Volume Integrals. In the series: Note 14. Subject: Surface and Volume Integrals or calculations. This note: Note 14: Surface and Volume Integrals or calculations. Please be sure that you are on a "level" at least equivalent to the contents up to, and including, note 13. This note is a very short introduction into "Surface and Volume Integrals or calculations". Chapter 1. What are we going to do here?. These are our well-known functions, as y=f(x), which can be graphed as some curve or line in the XY plane. Where F(x) is the "primitive" function of f(x). Please see note 8 for a discussion of the "primitive" function. However, here we largely repeat it again. But if needed, please revisit note 8 again. surface area between f(x) and the x-axis, in the interval a ≤ x ≤ b. Functions as z=f(x,y), which often can graphed as some "surface" in XYZ space (R3). Where "A" often is some rectangle in the XY plane, for which hold that a ≤ x ≤ b and d ≤ y ≤ e.
The integral can often be interpreted as the Volume enclosed by z=f(x,y) and the area A on the XY plane. Note: The double integral symbol, then should indicate that we work over multiple dimensions. Functions as w=f(x,y,z), cannot be simply graphed anymore: the space defined by points (w,x,y,z) is 4 dimensional. Where "V" *might" represent a "volume" bounded by certain conditions. throughout the body of material, or the value of some scalar function in Space etc.. I don't think that I will go into integrals of f(x,y,z) in this note. I'am afraid the note would be too cluttered. I will do that later, in one of my "basic physics notes". and get the "general picture" on how this stuff works. Also in (1) and (2) above, it is true that we cannot always interpret the result of the integral, as to be a surface (1) or volume (2). But in most cases, and certainly in the math we see here, the interpretations are correct. Chapter 2. Definite integrals of y=f(x). So, f(x) is actually the derivative function of F(x). Then what is the primitive function F(x) of f(x)? This time, the boundaries "a" and "b" in the integral equation, play a role. I am going to make this "likely" in the next paragraph. However, I like to provide an illustrative example first. Suppose we have the line f(x)=2x. In figure 1, the left most picture illustrates the graph of y=2x. This line goes through the Origin of the XY plane (0,0), and also goes through the point (2,4). You can probably see that a right-angled triangle exist, defined by the three points (0,0), (2,0) and (2.4). This triangle is just exactly half of the rectangle with sidelengths 2 and 4. So, the total surface area of that rectangle is 8, and thus for the right-angled triangle the Surface area is 4.
of the area of the rectangle defined by the points (0,0), (2,0), (0,4) and (2,4). Figure 1. Some illustrations that help interpreting a definite integral. If that would be so, the rest of chapter 2 is optional reading. But you might give it a try. Now, let's try to make equation 1 "plausible" for (continuous) functions in general. Take a look at the middle picture in figure 1. Here, f(x) represents any continuous function in the interval a ≤ x ≤ b . Suppose that you would not have any clue as to calculate the area under f(x) and the x-axis. Then you can always "divide" that area into thin rectangulars, as illustrated in figure 1. Next, you can easily calculate the area of any rectangle, since it's simply "length x width". Suppose you would use 10 of such rectangulars. You can calculate the area of all ten of them, and next sum them all up. It would be a nice approximation. The more you would use, the more accurate you get. Let's denote the number of rectangles by "n". Note that the width (along x) of such rectangle can be denoted by Δx, and the length by Δy. For each individual rectangle, say number "i", we can then say that the width is Δxi, and it's lenght is Δyi. Note: Σ is a shortcut for "summation", that is, that we sum all Δxi Δyi for all i from 1 to n.
Actually, I should not have used Δyi in above equation, unless we understand how to interpret it. Although, from figure 1 above, it's OK to use Δyi, it's a bit better to use f(Δxi). The "narrower" the rectangles become, the more accurate it is to use f(Δxi) instead of Δyi. also call equation 2, a "Riemann" sum. In the equation above, I used Δyi. Ofcourse, that is suggested by figure 1. However, if Δxi is very small, then the corresponding y values are ofcourse f(Δxi). Not exactly, but very close. If Δxi is extremely small, then it's very very close to being exact. (In equation 5, I left out the "i" subscripts). is really the same as F(b) - F(a). Note that with definite intergral calculations, any "c" will have no bearing whatsoever, since it will cancel out. We know that if f(x)=sin(x), then the primitive function is F(x)=cos(x). F(2π) - F(0) = 1 - 1 = 0.
of x=π is equal in size to the area right of x=π. You might say: the "positive" area, and the "negative" area, precisely "cancel" each other out. That would not be the best interpretation. Most folks would argue that both area's should be added. However, mathematically, in this example, the total integral just simply returns "0". This is why a definite integral is often calculated over an interval, where the function does not flip it's sign. in two parts, namely [a,b] and [b,c], and simply add the results. in order to obtain positive area's. But mathematically, you can integrate over an entire interval. the denominator would be "0". You can ofcourse calculate integrals, but not very close to "x=-1". These sort of functions, using fractional components, might seem somewhat impressive at first sight. But here, we too are not defenseless. In note 7, we explored the "ex" and "ln(x)" functions. There we saw that the derivative function of "ln(x)" is "1/x". So, here it is the other way around. If needed, please see note 7 again. Now, let's go to integrals of z=f(x,y). Chapter 3. Definite integrals of z=f(x,y). Take a look at figure 2. Here, you see a certain f(x,y), represented by the surface in R3. Figure 2. 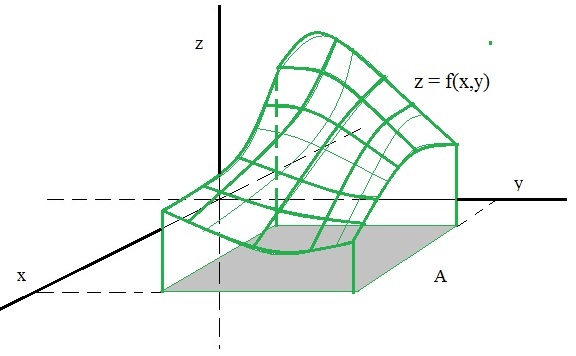 A surface, as the representation z=f(x,y) in XYZ space. I'am not much of an artist, so I just hope you indeed see a "surface" in figure 2. In figure 2, you see the square region "A" which lies in the XY plane. This is the region over which we integrate. By the way, it does not have to be a square, or rectangular shaped. If we integrate "over" "A", the definite integral is equal to the volume under the surface z=f(x,y). be interpreted as a "volume calculation". But often, it is indeed correct. In analogy of chapter 1, we can divide the volume in small 3D blocks, starting on "A" and rising up to z=f(x,y). your approximation by summing all individual volumes to a grant total. Or, you could use "n" blocks along the x direction, and "m" along the y direction, to make it more "general". - at last, you would take n=n, and then sum all volumes of the m blocks along the y direction. Then, sum over all "n". Do you already see a double Riemann summation appear? Suppose area "A" is really rectangular. The corners then can be notated as "a" and "b" (along x) and "c" and "d" (along y). If the blocks get very narrow, or in other words, n and m are very large, then we have a Riemann sum again. a Riemann sum again. It's just a matter of a universal agreement among folks, on how you write things down. That's all really. Just as the algolrithm above, we would calculate the double integral, by integrating "over x" first, considering y as constant. Then we would integrate "over y". Or, if the math seems to be easier, we can integrate "over y" first, and then "over x". In this way, you have a sort of "inner integral" you do first, en then you go for the "outer" integral. I would not like to give you the impression that it always goes like this, because that would not be true. But, in many cases, it does, so that's why you see it here as listed as the main method to solve integrals of this type. Suppose we have the function z=f(x,y)=x2y. It's a relatively simple function, but the "principle" applies to general functions as well.